Long radio silence usually means that I’m up to something. (Or that I’m sick. But this time it means I’m up to something!) This year, I’m actually up to several somethings, and it’s time to announce one of them! 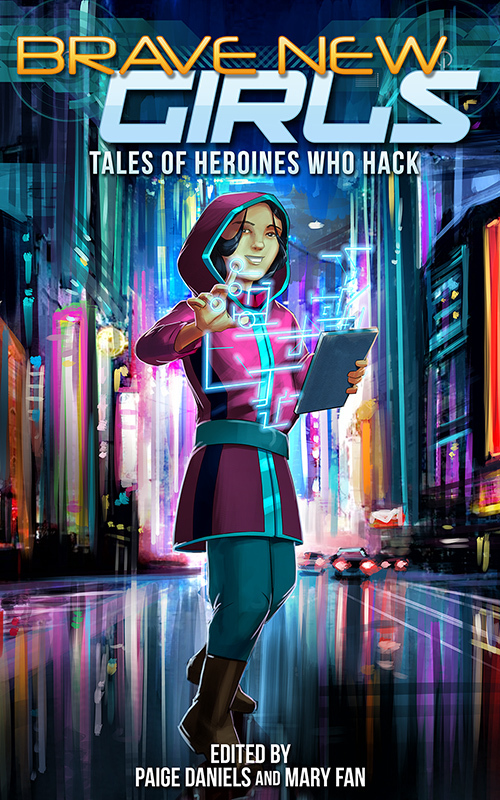 I’m pleased to announce that I have a short story that’s going to be published in the third volume of Brave New Girls: Tales of Heroines Who Hack! BRAVE NEW GIRLS: TALES OF HEROINES WHO HACK is a YA sci-fi anthology (edited by sci-fi authors Paige Daniels and Mary Fan) featuring stories about girls in STEM (Science, Technology, Engineering, and Math)… Girls who hack not just computers, but whatever puzzles come their way, using their smarts to save the day. It’s got sci-fi mysteries, cyberpunk, space adventures, and more! Proceeds from sales of the anthology will be donated to the Society of Women Engineers scholarship fund. 17-year-old Delia Randall spends her days studying aboard a massive scientific submarine and building robots in secret. But her secret comes out when disaster strikes the GalaX Undersea Habitat, and the only one who can prevent tragedy is Delia—and her hand-built ROV, Amphitrite. I’m also very excited to be contributing an illustration to the book as well! I can’t wait to share this story with you when Brave New Girls: Tales of Heroines Who Hack releases this July. I’ll have more info about Brave New Girls as the release date gets closer! In the meantime, you can add it to your to-read list on Goodreads here, or visit the official BNG website here. Want to be the first to know when the book launches? Sign up for the release day mailing list here!